Open Climate Question For Next Presidential Debate: How Will You Deal With What NASA Scientists Are Calling a Global Climate Emergency? This year, James Hansen, head of NASA’s GISS division warned that the world is experiencing a global climate emergency. Around the world, scientists are making increasingly dire warnings about what is happening to our climate. Links between extreme weather and our production of greenhouse gasses have been firmly established. The human driven heating is causing the Arctic sea ice to disappear, perhaps in as soon as a few years. The US has just experienced 12 years of extraordinarily dry conditions and a year of record drought. And the world is teetering on the edge of a climate-change driven food crisis. Yet this year’s Presidential debates have been stunningly silent on the issue of climate change. In our politics, denial of the events occurring just outside are becoming increasingly loud and shrill. And millions and millions of dollars in oil, gas, and coal campaign contributions are enforcing an unprecedented silence on an issue of growing emergency and immediacy even as they encourage an increased exploitation of the very fuels that are causing our climate nightmare. Within 10-20 years it is possible that the American grain belt will be well on its way to becoming a desert. Within 10 years, it is likely that the Arctic sea ice will be gone and a very intense period of ice melt will begin for Greenland, greatly accelerating the rate of sea level rise. Within 30 years, it is likely that the world’s oceans will be highly acidic, less likely to produce food for humans, and almost entirely devoid of corals. By the end of this century, it is likely that much of the world will be rendered a wasteland by 1000 ppm CO2. All this if we continue down the path of unmitigated extraction and burning of fossil fuels. Please address the issue of what climate scientists have identified as an ongoing, climate change induced US drought and growing prospects for world hunger. Please address the issue of shrinking Arctic sea ice, more than 50% smaller than in the 1980s, record Greenland ice melt, and what appears to be increasing risk of rapid ocean rise. Please explain how you will avoid a devastating rise to 1000 ppm CO2 by the end of this century. Please address how you will deal with what NASA scientists are calling a global climate emergency. If you agree with this question, please feel free to either copy, paste, and re-post it or to link, share, or re-tweet this blog. If you would like to ask an open climate question of your own, please do so on any social network of your choosing. The idea is to spread the word in the best way possible. So please participate in some way! Please let your voice be heard! This is a question we are all currently involved in answering. And if we stay silent, then the answer is we will do nothing and the worst events are almost certain to occur. But if we speak up. If we make our voices heard, they still have a chance to make a difference. To stop the worst impacts of a climate change nightmare caused by our ever-increasing burning of fossil fuels. Best to you all! And please don’t forget to lift your voices and BE HEARD! This year, Arctic sea ice hit a devastating new record low for the summer creating an enormous zone of open water. This vast open area is making sea ice re-freeze more difficult. As a result, rates of re-freeze are lower and slower than in previous years. The effect is that sea ice area anomaly — the gap between the average sea ice for the years 1979-2008 and today’s value is increasing. Today, that value hit a new record, breaking the old record of 2.65 million square kilometers below average set in 2007 and touching 2.705 million square kilometers below the average range of 1979-2008. This new record was driven by a slowing down of re-freeze over the past few days, the result of high temperatures and strong storms hampering re-freeze of Arctic seas. Average refreeze rates fell to around 30,000 square kilometers per day over the past few days during a time when a typical re-freeze would indicate 60,000 to 80,000 square kilometers per day or more. Since the record low anomaly for 2007 is included in the 1979-2008 average, this new record low anomaly is even more substantial than initial estimates would indicate. Thought the gap between today and the average is 2.705 million square kilometers, the gap between today and this date in 1980, for example, is 3.25 million square kilometers. So sea ice area for today is 46% lower than the same day in 1980. This feedback is an Arctic response to human caused global warming that is currently resulting in more extreme weather within the US and around the world. And, thus far, NOAA’s climate extremes index shows that 2012 is the worst year on record. Today, sea ice area continued a moderate rate of advance for this time of year. Overall, values increased by about 60,000 square kilometers to reach 2.82 million square kilometers, which is still below the record low set just last year. 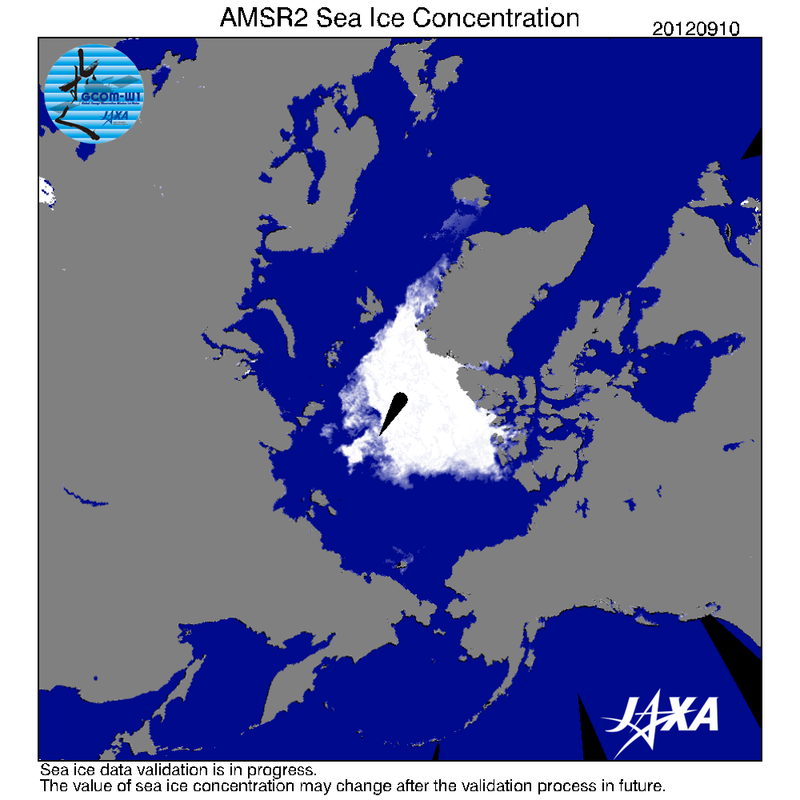 JAXA and NSIDC are also showing moderate rates of refreeze, with extent values still below records set in 2007 before they were shattered this year. Overall, JAXA and most monitors are showing sea ice area and extent at record lows for this date and at 55-60 percent below seasonal values for this day during the 1980s. Most telling in these graphs and images is a massive loss of five year or older ice from 2007 to 2012. 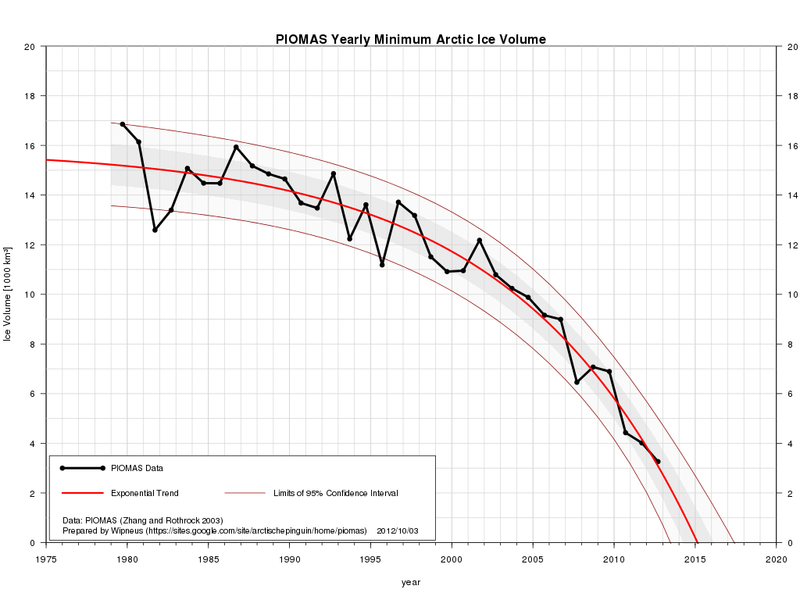 The result is that Arctic sea ice is even more vulnerable to melt than it was post 2007. The Arctic has a long way to go to have any reasonable resemblance of recovery for this time of year through winter. And with temperatures beginning to fall throughout the region it does seem likely that rates of freeze will pick up a bit. 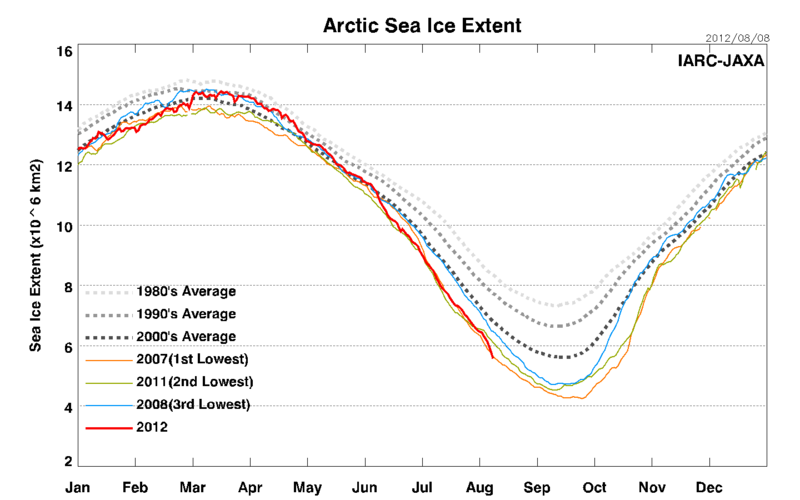 However, a lot of heat energy remains locked in the water and the Arctic has a severe ice deficit to recover from. So it remains doubtful whether winter refreeze will better the Arctic’s position to endure the summer melt coming in 2013. Arctic re-freeze officially began on September 19th. 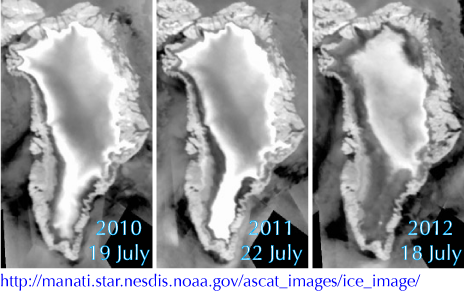 Now, twelve days later, all monitors are still showing sea ice area and extent below the record low set in 2007. Overall, departures from the 2007 minimum are still in the range of 150,000 to 250,000 kilometers. At the current pace of refreeze, it will still be a few more days before the lowest extent for 2007 is exceeded in some monitors. 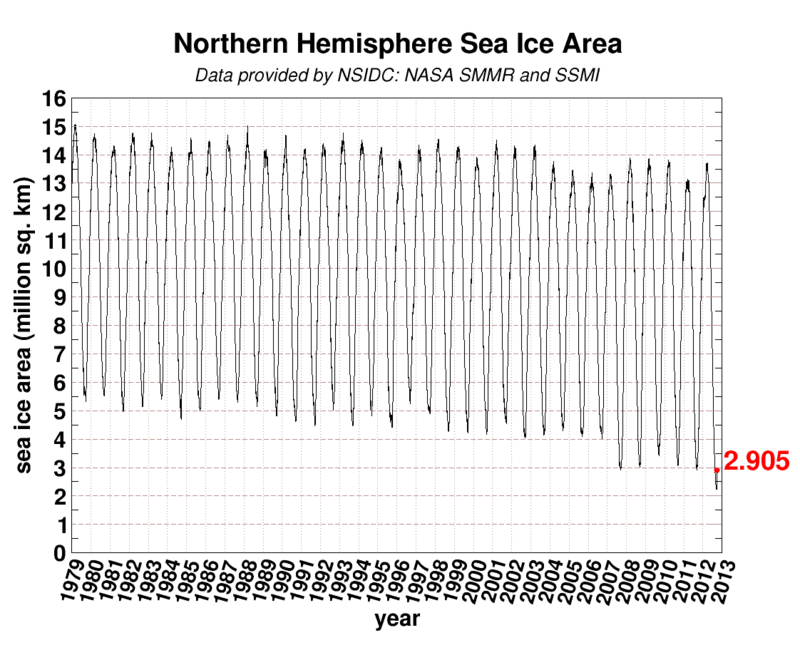 Departures from the ‘average’ sea ice area for the period of 1979-2008 are still very high at 2.48 million square kilometers below the ‘norm.’ Departures from values seen during the 1980s, however, are much greater. In the range of 3.8 million square kilometers below values for the same date. 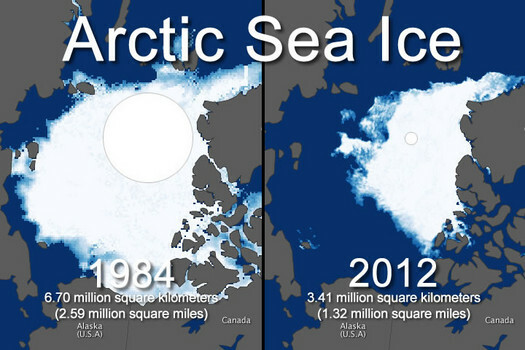 This is a loss of 58% of sea ice for the same period since the 1980s. As for sea ice extent, you can see from the graph below that we are also currently in the range of about 60% less than the 1980s for the September minimum. Current values tend to be holding this difference. As we go forward into winter we would expect at least some of this gap to erode. We’ll have to see by how much as the season progresses. All current measurements for sea ice are showing record low values for this date in history and, as noted above, current values are still below all time records for every year except for 2012. 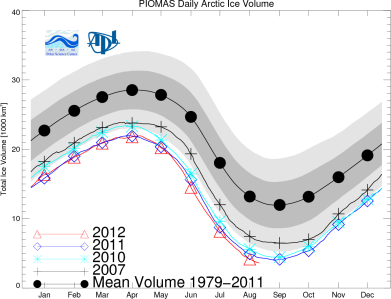 We are still waiting on a final sea ice volume measurement from PIOMAS to determine yearly volume losses for 2012. So far, losses are in the 400 cubic kilometer range. But this official measurement is as of August and a final number for September is yet to be produced. 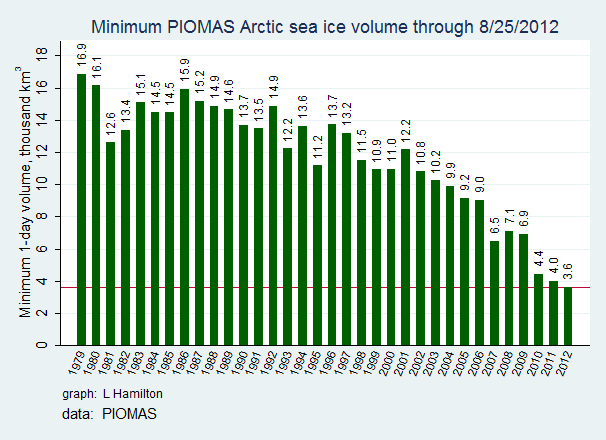 An excellent visual of sea ice volume losses through August 25, 2012, provided by L. Hamilton, can be seen below. According to a recent study produced by Columbia University, and funded by the U.S. National Science Foundation and the Keck Geology Consortium, the Arctic is now hotter than at any time during the last 1,800 years. The Medieval Warm Period, often cherry picked as a benchmark for global warming deniers, was 2 to 2.5 degrees Celsius cooler than the current high Arctic environment. The study observed differences between the content of saturated and unsaturated fats in dead algae in lake sediments to determine temperatures through past ages. During cold periods, algae produce more unsaturated fats. During warm periods, the amount of saturated fats produced is greater. This provided researchers with a biological thermometer for past Arctic ages. You can view a very instructive video of how the differences in these fats is used as a thermometer here. Earlier studies have shown that areas bordering the Arctic, such as southern Greenland and parts of Canada, were warmer than today. But the new data, coming from a Svalbard lake, show that the high Arctic was cooler. This broader picture shows that the Medieval Warm Period was more of a regional phenomena while, now, the entire Arctic is undergoing a massive heating not seen in ages. This study is a major validation of others that have shown a regional warming during medieval times. 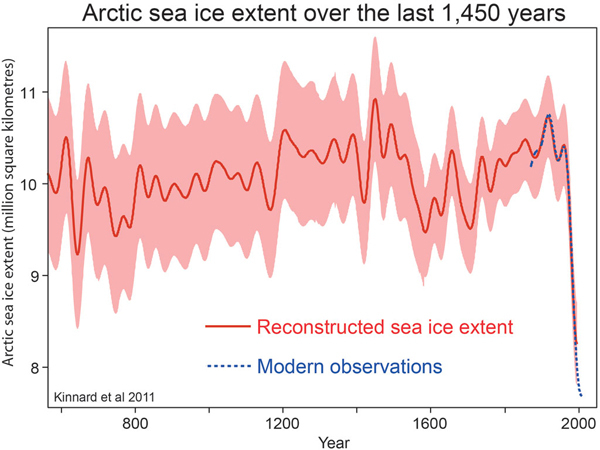 One such study was the famous ‘Hockey Stick’ graph produced by Michael Mann. Natural cycles, often invoked by climate change deniers as a form of pseudo-intellectual argument, would result in the Arctic and the rest of the world cooling long-term. In fact, there is no natural force now acting on the Arctic that is capable of pushing its temperatures into a range not seen since 1,800 years ago. The Svalbard measurements now combine with a number of other sources, including Mann’s now-famous hockey stick graph, to provide solid evidence that the human forcing (greenhouse gas emissions) is pushing world temperatures unnaturally high. As you can see in the graph, average world temperatures decline until major use of fossil fuels begins in the mid-19th century. At that point, temperatures rocket upward along a very steep slope. A very unnatural departure for the relatively stable Holocene epoch. What is most concerning is the fact that we are still in the early phases of Arctic and world warming. Because the areas of ice are so vast, because the ocean is so deep, because it takes lots of energy to move the atmosphere around and to heat it up, a huge amount of inertia exists. This inertia is fighting to keep world temperatures static. It is fighting to keep the glaciers and sea ice from melting. It is fighting to keep the weather systems in place. But the vastly powerful human forcing of greenhouse gas emissions is moving these systems around like so many enormous toys. The fact that we are already seeing so much melt, that we are already seeing temperatures outside the range of nearly 2000 years is cause for serious, deep concern. Geologists don’t have any kind of clear record for these kinds of changes ever moving along so fast. But they don’t have any kind of record for greenhouse gasses accumulating in the atmosphere at so fast a pace either. The most recent observable corollary occurred about 50 million years ago and happened at a speed 1/10th as fast as the human greenhouse gas accumulation. The related warming caused a mass extinction in the ocean and resulted in severe stresses to land animals whose end result was greatly reduced size and weight as animals concentrated in mountains and near less productive polar regions. Inertia has already created a major overhang of climate impacts. At around 400 ppm CO2, the amount currently in the Earth’s atmosphere, Greenland and West Antarctica melt, contributing about 75 feet to sea level rise. The problem here is that the current forcing is likely enough to push another 100-200 ppm of CO2 out of the Earth’s oceans, forests, tundras and glaciers, lifting world CO2 into the range that could result in all the ice melting and another mass extinction in the oceans. That risk is current even if we stop producing CO2 today and will likely result in the need for CO2 capture from the atmosphere or possible, and very risky, applications of geo-engineering technologies. Continuing to burn fossil fuels at volumes great enough to increase CO2 concentrations by 2-3 ppm or more per year is nothing short of an exercise in madness and will likely result in a world with near 1000 ppm CO2 by the end of this century. And though a world at 600 ppm CO2 is tremendously difficult to live in, a world at 1000 ppm CO2 is a hellish nightmare. Putting these things into context, even if we cease all fossil fuel emissions today, we are potentially on a path to conditions not seen in the last 10-30 million years. 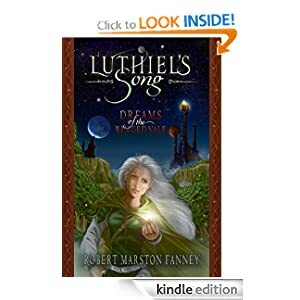 And, if we continue emitting fossil fuels in a business as usual manner, we are heading toward conditions not seen in the last 50 million years at least and perhaps never seen before. As such, the current 1800 year warming happening in the Arctic is just another milestone along our current road. And that way, should we choose to continue, is little more than a short, hot road to hell. It is unlikely that the world’s view of Arctic sea ice will ever be the same after the 2012 melt season. What was revealed was a thin film of fragile ice now at the mercy of rising temperatures and an ever-increasing number of forces that could result in ice melt, break-up, and scattering. So even as seasonal re-freeze begins there is much inherent in this dynamic set of Arctic systems changes to take account of. In fact, it is important that these trends be tracked as we enter an age of uncertainty, instability, and messy transition. Currently, the story in the Arctic is shifting from record lows in sea ice extent and area, to the difference between past ‘mean’ values of sea ice area and what current observations can tell us. It is important to note that all measures show sea ice area and extent below the past record low set for this date. And the relatively slow re-freeze of the Arctic sea ice combined with this very low value raises the possibility that a new record will be set. That record is defined as sea ice anomaly — a departure from an established average of sea ice area over the period of 1979-2008. The above graph, provided by Cryosphere Today, shows not only the current area of Arctic sea ice, it also shows the difference between now and the 1979-2008 mean. It is important to note that this value is somewhat skewed due to the fact that sea ice has been in continuous decline ever since the satellite record began. 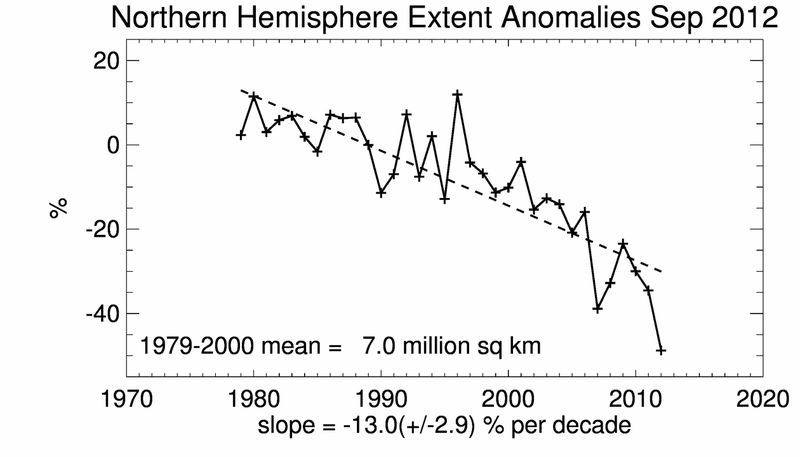 So the 1979-2008 ‘mean’ averages not a base-line period of relatively stable sea ice. It instead averages a period of melt. All that said, departures below this ‘mean’ are currently at 2.482 million square kilometers. This value is very close to the record set in 2007 of 2.635 million square kilometers below the mean. A breaking of this record would be even more significant due to the fact that the current ‘mean’ includes the two very low years of 2007 and 2008. Looking at conditions in the Arctic, weather patterns would tend to indicate a greater spreading out of the sea ice and a faster re-freeze. Checking this value is a cloudy and stormy overall Arctic environment which would tend to trap heat. As this year has shown that traditional weather links to re-freeze have been obliterated by increasing heat energy in the Arctic system, a look at weather patterns alone can’t provide us with much in the way of reasonable assurance. So heat itself and heat retention becomes much more important. A view of the graph below shows us that Arctic temperatures above the 80th parallel are currently well above normal — in the range of about 10 degrees Fahrenheit above what is considered average for this time of year. In any case, a 10 degree F departure from the 1958-2002 mean shows a lot of heat energy still retained in the Arctic and generally failing to bleed off at the typical freezing season’s rate. You can see this delay by looking at the slope of the 2012 temperature line, which is no-where near as steep as the slope of the ‘mean’ temperature line. The above map shows that much of the Arctic is currently in the range of 3-11 degrees C (5-19 degrees F) above the 1985-1996 mean. It is worth noting that the 1985-1996 mean, though far warmer than the 1960s, does not include the series of record hot years of 1998-2002. 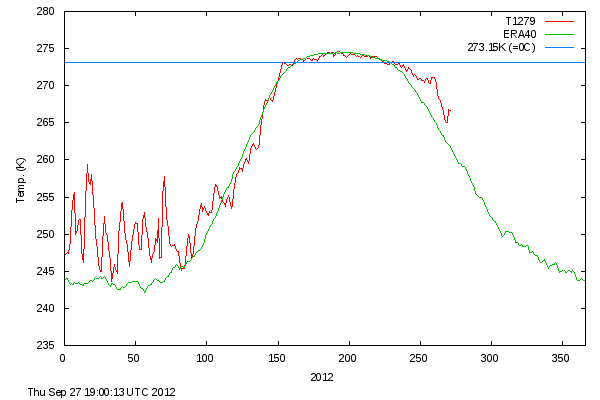 These very high temperatures show that a massive amount of heat is still being retained in the Arctic. So there is a high potential for the record anomaly set in 2007 to be broken over the next couple of weeks. “The scientific community realizes that we have a planetary emergency. It’s hard for the public to recognize this because they stick their head out the window and don’t see that much going on.” — NASA Scientist James Hansen. So much has happened, so much keeps happening, that it is becoming increasingly difficult to keep track of all the accumulating impacts posed by human caused climate change. 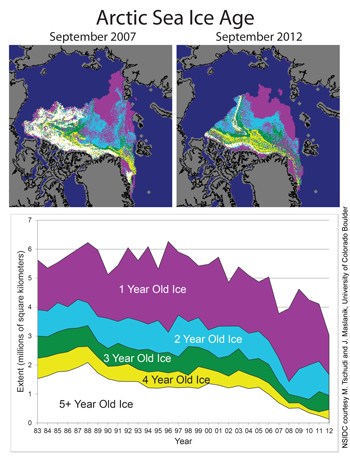 Much focus has been placed upon the rapid melt of Arctic sea ice this year. And this visible sign of the damage caused by human greenhouse gas emissions is as good a place to plant our global warning flags as any. Overall losses for this year have been vast and dramatic, averaging at around 700,000 square kilometers between all the agencies reporting sea ice extent and area. But even this amazing loss does not, entirely, put into context the current condition of Arctic sea ice. David Barber, a veteran Arctic researcher, recently characterized the state of Arctic sea ice by calling it ‘rotten.’ In Barber’s parlance, ‘rotten’ ice means ice flows that are broken and filled with holes or vast expanses of ice speckled with melt ponds that inevitably bore on down through the surface. Thin, fragile ice vulnerable to the action of waves and weather. And this year, Barber is noting that the ice is rotten almost all the way to the North Pole. “The multi-year ice, what’s left of it, is so heavily decayed that it’s really no longer a barrier to transportation,” Barber says, describing how melt ponds leave much of the ice looking like Swiss cheese. “You could have taken a ship right across the North Pole this year,” he concludes. Barber notes that we are heading to a seasonally ice free Arctic by around 2020, plus or minus five years. Barber goes on to point out that the last time the Arctic was seasonally ice free was millions of years ago and that the current pace of melt is unprecedented in the geological record. But we are already starting to see Earth’s response. All over the globe, fires and droughts are multiplying, impacts to crops are intensifying, storms are growing stronger, more violent, damage from weather disasters is hitting new records. And the weather patterns themselves are changing. This year, the jet stream has shifted into a new phase, nearly permanent for the past six months, in which warm air is dredged up out of the sub-tropics and dumped square over the vast ice sheets of Greenland. The result was the most rapid melt ever on record for this great frozen land. The same deviant jet resulted in the worst drought in the US in the last 55 years, a drought that continues to expand gobbling up more farmland. Hope for respite from this drought continues to diminish as the west and heartland revert to conditions of heating and drying. Neven is right and not just for Arctic sea ice. We have entered the age of consequences in which worsening and far-range impacts from climate change will appear and intensify around the globe. And, given the speed and violence of the human forcing, the pace of change shows potential to exceed anything seen in the geological record. A few weeks ago, NASA scientist James Hansen began calling the current climate state a planetary emergency. This fact, now ever more visible, should be a clarion call to action. And the ever more seeming responsible and salient environmentalists are calling for cuts and curtailments to world carbon emissions. The time for delay has long past and, even if we respond now, we should be hard put to it, very hard put to it, indeed, to push through this vast and growing crisis. We are likely currently on a very fast track toward a melting Greenland and West Antarctica. And under business as usual carbon emissions, nearly 1,000 ppm CO2 appears likely by the end of this century. Simply put, a human civilization of any rough allegory to our own cannot exist in such a world. To call the current situation an emergency is a simple statement of fact. It is responsible to identify this emergency and to urgently call for response. It is time to turn away from the voices who have for so long been wrong and to listen instead to those who have an actual window on what is happening. On what is likely to happen. And on what will surely happen if we don’t work to curtail emissions now. ”Our society, our civilization and how we live our lives – it’s all predicated on a stable climate system,” says Barber, who notes that the planet has undergone abrupt climate change in the past and could do so again. “The take-home message for people is we are running an experiment with Earth’s climate system,” says Barber. And the experiment is now starting to go haywire. Last week, Arctic Sea began a gradual re-freeze from the extreme record low values set this year. Now, after about a week of re-freeze, values remain below the records for extent and area set in 2007 and 2011. According to JAXA, sea ice extent is now 3.87 million square kilometers, nearly 400,000 square kilometers below the record low set in 2007. Cryosphere Today is showing sea ice area at 2.57 million square kilometers, about 350,000 square kilometers below the 2011 record. At the current rate of refreeze, it will be sometime in early October before sea ice area and extent begins to surpass the record lows for these years. In total, sea ice area and extent are tracking nearly 4 million square kilometers below the 1980s average and about 2.4 million square kilometers below the average range for 1979-2008. 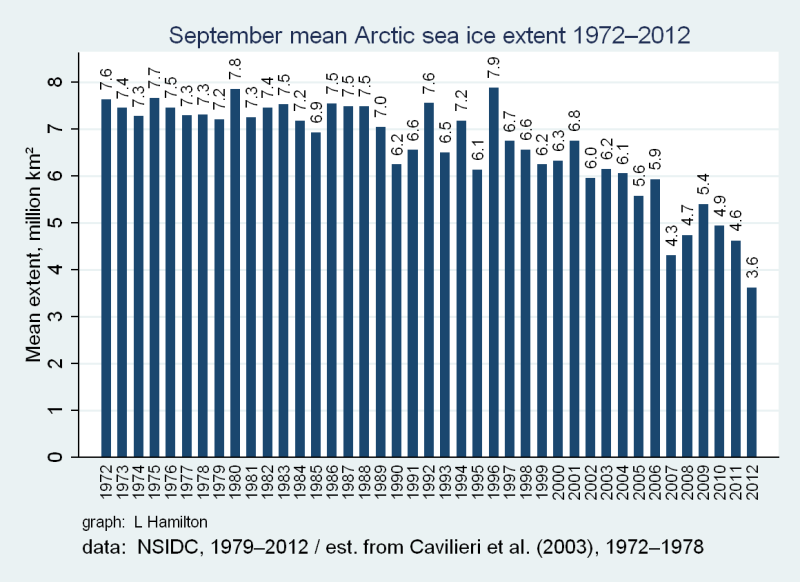 For the date of September 25, both sea ice area and extent are currently at an all-time record low. With the seasonal shift, we are currently beginning to see refreeze. But it important to put this refreeze into context — it will likely be mid-November before the Arctic even begins to reach extents usually experienced during late summer as near back as the 1980s. To forget the vast melt of 2012 and continue on as if we are in a state of normalcy would be a vast failure of rational thinking. Today is September 13th. We are two days from a typical melt season’s end. And yet this melt season is anything but typical. After a brief period when weather conditions seemed to favor a stop in sea ice melt, melt has resumed. So, late in the season, we are still reaching new substantial record lows. Today we’ve seen declines in both sea ice area and extent. JAXA fell 6,000 square kilometers from yesterday’s record to hit a new low of 3.585 million square kilometers. Cryosphere Today, on the other hand, fell by more than 50,000 square kilometers to reach a new record low of 2.262 million square kilometers. NSIDC is holding at near its record low set just yesterday. Overall rates of decline are still a little steeper than for this time in 2007. So given these decline rates, it seems that yesterday’s call for 1 or 2 new record lows may be premature and that another series of record low days are in store. Conditions in the Arctic are still dramatically warm for this time of year, though weather patterns have shifted into a phase that should encourage re-freeze. This has been the case over the past week. But melt is still ongoing. The best conclusion is that Arctic heat content and ice fragility are resulting in patterns that do not conform to typical Arctic weather and ice response. BBC and a number of other news outlets are finally starting to report on this year’s record ice loss. However, reports from these news agencies are using data from back in late August, so their reports do not, as yet, show the full extent of this year’s dramatic ice loss. Regardless, these reports are useful in spreading the word about the highly rapid and volatile decline of Arctic sea ice. You can view the BBC report here. Of particular note is that news agencies are beginning to report on the groundbreaking work of Jennifer Francis showing how loss of sea ice is affecting the Jet Stream and enhancing extreme weather events around the world. The first major outlet to report on Francis’s findings was Think Progress. But it now appears other outlets are starting to follow suit. Radio ecoshock has an excellent interview with Ms Francis here. Extreme weather resulting from these patterns includes extended cool, wet, and rainy periods resulting in more floods or extreme snowfall events and extreme heat and dryness resulting in more droughts. The march of these weather patterns around the world is likely to result in greater damage to modern infrastructure, in harm to crops likely to result in food scarcity and increasing prices at the grocery store. These are just the kinds of weather patterns that the world has been experiencing with greater and greater frequency since the 1990s. The current loss of sea ice and snowpack in the Arctic is likely to result in even more extreme weather to come. As the Arctic melt season draws to a close, an intensifying battle between melt and freezing can cause values to push higher one day and then lower the next. This appears to be what is happening. Sea ice area showed some refreeze today with Cryosphere today about 40,000 square kilometers above the record low set yesterday. Sea ice extent as measured by JAXA saw both a data revision and a bit of re-freeze push numbers 100,000 square kilometers higher than the previous day. Since data is preliminary, these revisions can and do happen. The JAXA revision will also change the current record low established by that agency. NSIDC, on the other hand, after showing a slight re-freeze over the past few days has again pushed down below 3.5 million square kilometers of sea ice extent. So it appears we have some disagreement in the various sea ice monitors which is pretty typical for this time of year. Looking at the sea ice, we can see expansion in the regions north of Alaska while sea ice still appears to be receding in the Arctic Ocean north of Siberia. Some areas of the Canadian Archipelago are still seeing melt as well. Weather conditions appear to be favoring refreeze but, as mentioned in previous posts, this year has tended to buck trends. That said, the current bump in both area and extent in some sea ice monitors seem to show a response to this weather pattern. In any case, until a trend establishes itself, it is still too early to call an end to this year’s record and anomalous melt. Is The ENSO Signal Being Over-Ridden by Global Warming? The periodic switch between warm and cool surface ocean temperatures over the eastern equatorial Pacific has long been a powerful driver of global weather. The reason is that such a large body of water can do major work moving weather patterns depending on its relative cool or warm state. This area of the Pacific is very large — about 9 million square kilometers and it sits directly below the equatorial wind flows. So warming and cooling in this region pushes weather governing winds, changing the direction of storms and the location of droughts, serving as a powerful governor of world weather and climate. But human caused global warming may be shifting the role of ENSO into a secondary governor of climate. The reason? 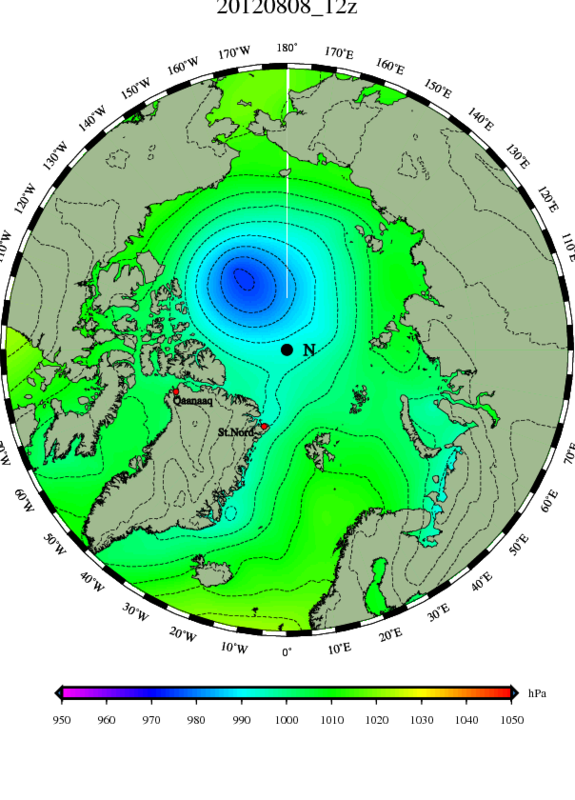 Large areas of open water in the Arctic and northern oceans are now subject to excess heating. Take a look at the map above and you will notice a large region of much warmer than average water located in the polar, Arctic, and high temperate zones. Almost the entire Arctic Ocean, the region of Hudson Bay, the Canadian Archipelago, the sea directly west of Greenland and the North Atlantic are all experiencing sea surface temperatures far exceeding the average range. A large area of the northern Pacific is also experiencing abnormally hot conditions. The abnormally high temperatures in these regions cover ocean areas as much as twice as large as the region typically affected by El Nino. The change in heat distribution of these waters alters the circumpolar jet stream. It changes the path, location, duration and intensity of storms. It can make cool and wet periods last longer. It can make dry and hot periods also last longer. It is the main element influencing the blocking patterns that have been so prominent in weather events over the past decade and a half. Finally, it may eventually alter the turn of the northern hemisphere seasons. For as it intensifies, it has the ability to change winter into something that may be well unrecognizable from the seasons as they’ve existed over the 20th century. This heating of the northern hemisphere land and water becomes a periodic event intensifying toward the end of summer. 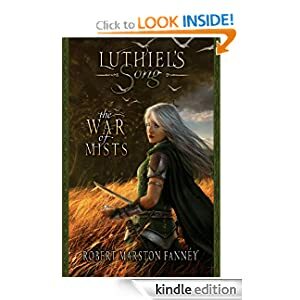 But it is the ability of this latent heat to melt ice, move air masses, cause huge swoops in the jet stream, alter the seasons, and extend the duration of weather events that may result in its over-shadowing the signal coming from El Nino and La Nina. It is particularly worth noting that, despite La Nina being very strong over the end of 2010 and throughout 2011, 2010 was the hottest year on record and 2011 was the 9th hottest year on record and the hottest La Nina year on record. Usually, a powerful La Nina like the one occurring in 2011 would have pushed world temperatures dramatically down. But we still experienced a record year. Also, strong El Nino years have typically resulted in the world reaching new record high temperatures under global warming. Not so with 2010. That year was a year that transitioned from weak El Nino to strong La Nina. Yet temperatures were still high enough to break a new record. What appears to be happening is that the global warming signal is becoming large enough to over-ride the signal coming from El Nino and La Nina. If we think of these two forces as wave patterns, the size of the human caused global warming wave is now large enough to confuse and dilute the, now smaller, El Nino, La Nina wave signal. This seems to be true, again, for 2012 where a strong La Nina is transitioning into a very weak El Nino. Yet all the recent months have been much hotter than the climatological average with June and July both being the 4th hottest on record. And though it is likely that the strong La Nina influenced the Texas drought of 2011 and the 50 year drought of 2012, the fact that La Nina has faded while drought conditions have persisted should be a clear indicator that La Nina is no longer sitting in the driver’s seat. The fact that human caused global warming is now the primary driver of extreme weather events has now been validated by many scientists. The IPCC, NOAA, and NASA have now all linked extreme weather to human caused global warming. In addition, Jennifer Francis and colleagues have also produced a report showing how loss of sea ice is driving the powerful blocking patterns we’ve seen linked to extreme weather events over the past two decades. So, moving forward, it will be important for weather forecasters to identify atmospheric changes due to human global warming if they are to accurately predict weather over extended periods in the future. A tragic, devastating, and mostly ignored in the media, loss of Arctic sea ice is still ongoing. Today, sea ice area fell below the threshold of 2.3 million square kilometers to touch 2.29 million square kilometers today. By comparison, the total land area of Greenland is about 2.1 million square kilometers. Sea ice extent also fell again today reaching 3.59 million square kilometers and breaking the threshold of 3.6 million square kilometers. The record retreat this year has extended the vast losses seen in 2007. Now, it appears there is dire risk of losing the Arctic ice, its related habitats, and the cooling services it provides. This will have a number of very powerful impacts, not the least of which is economic. A Pew Study recently estimated that added cooling costs alone resulting from the loss of Arctic sea ice could total between 4.8 and 91.3 trillion dollars by 2100. The fact that this study was based on model estimates for sea ice area, which have tended to vastly lag observations, means that the lower range of estimates is far too conservative. Other impacts include far less predictable weather, enhanced Greenland melt, and a potentially devastating erosion of seasonal variability. With much of the energy from sea ice melt now transferring to the land-bound ice sheets of Greenland and, to a lesser extent, Antarctica, we can expect weather patterns that result in rapidly increasing melt in these regions. James Hansen has identified a problem in ice melt forecasting. The question involves Greenland’s ice melt’s rate of doubling. 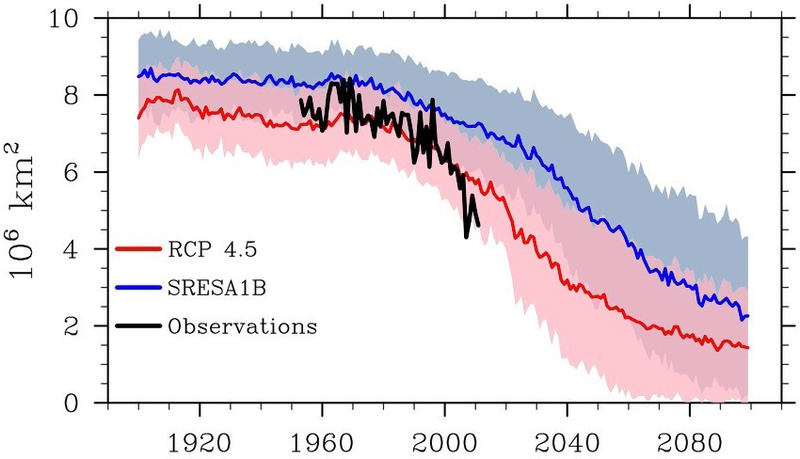 Hansen notes that melt rate could double every ten years or as quickly as once every six years. Either melt rate doubling is severe. But a six year doubling rate would have a terrible impact on sea level rise. Likely, even the doubling rates don’t paint the whole picture, with large single melt pulses increasingly likely as heat builds in the region of Greenland. Areas of high pressure are indicated in green, yellow and red. Areas of low pressure are indicated in blue and purple. Since 2007, this pattern has been emerging with particular strength. It is likely that ice loss is a major contributor to the emergence of this new weather pattern. 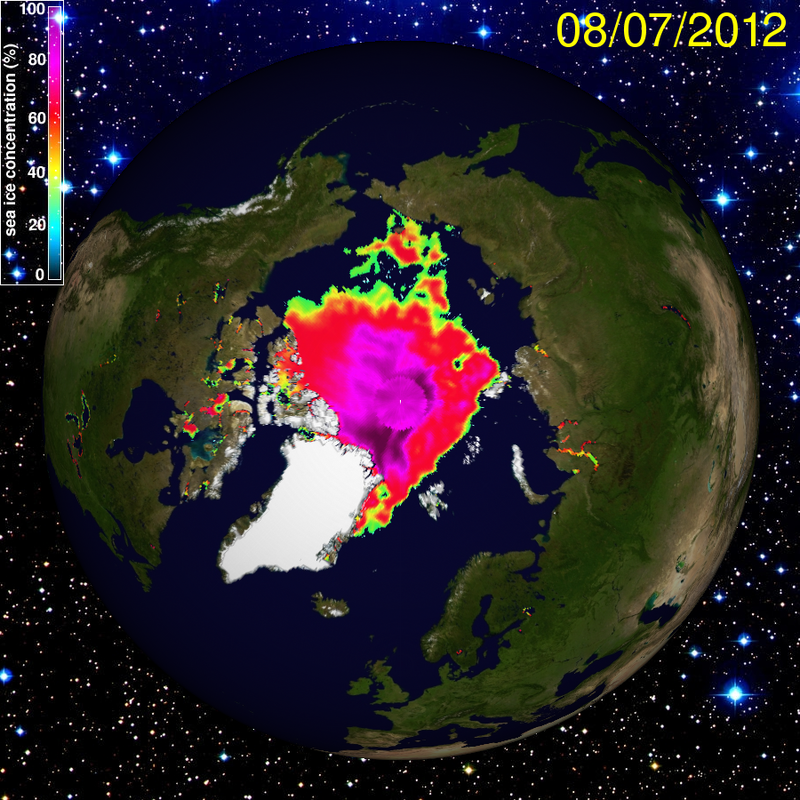 Now all major values for sea ice area and extent are more than 600,000 square kilometers below previous records. 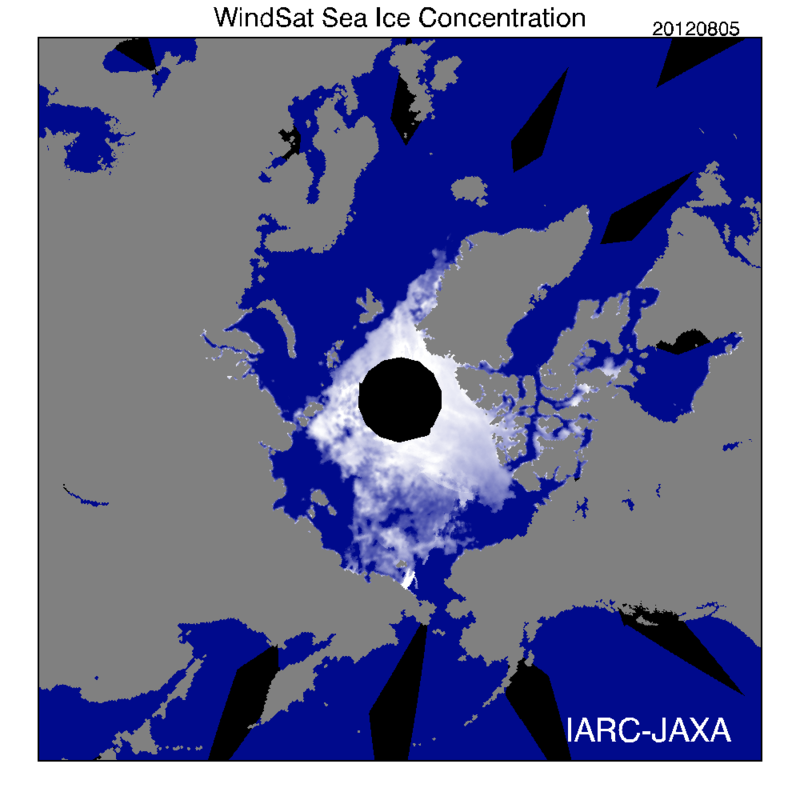 Percent losses from the previous record low are: JAXA 15.4%, Cryosphere Today 20.5%, NSIDC 16.3%. For a single year, this is a very high rate of loss. September 15 marks the melt season’s average end date and we are still one week away. However, highly variable Arctic weather has resulted in melt seasons over the past 30 years ending any time from late August to early October. Though these petitions are helpful measures, any chance of saving the Arctic from total loss of sea ice within the next generation will require a massive cessation in the use of fossil fuels and, likely, the application of a number of technologies that actively remove carbon from the atmosphere. That is the situation we are now faced with. And we need to raise awareness as rapidly as possible or face even more devastating consequences. Today, sea ice in the Arctic continued what is shaping up to be a truly historic melt. 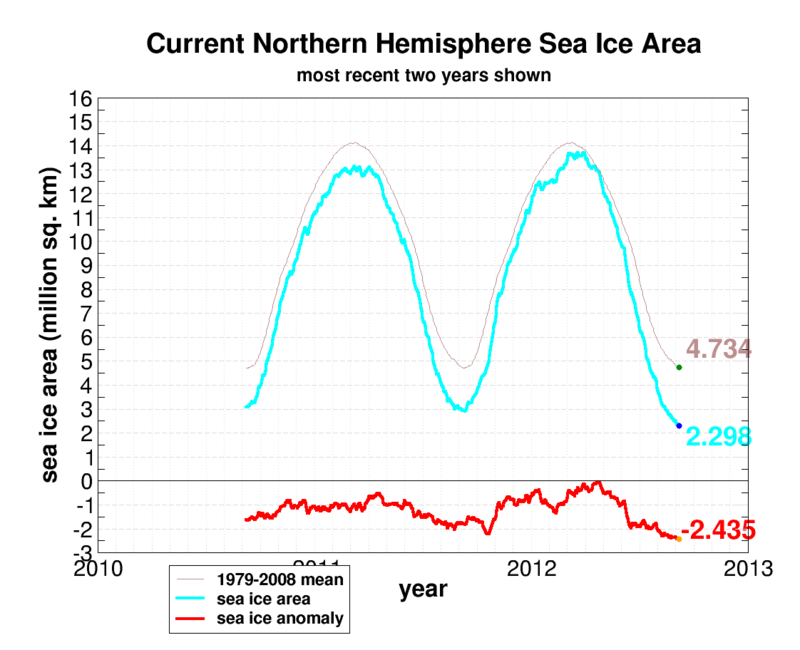 Sea ice area fell to 2.364 million square kilometers as sea ice extent fell to 3.614 million square kilometers. These measures reported by Cryosphere Today and JAXA are the lowest in the satellite record. Looking at the sea ice, you will notice that many ship passages are open through the Arctic. Most of the Canadian Archipelago is clear of sea ice and a broad swath of ocean north of Russia is also clear. Though melt trends do appear to be slowing, a daily retreat of ice at this time of year is very unusual. And this is just what we’re still experiencing. Given this inexorable melt, we should entertain the possibility that sea ice will continue to fade past the average cessation date on September 15th. And an extended period of melt this year would exacerbate already staggering losses. There are a number of factors at play currently enhancing end-season melt. However, these factors are all long-term, and appear to have over-ridden the short-term influence of weather. The conditions that so dramatically enhanced melt in 2007 were not present through most of this year. So it is only possible to blame this year’s melt on increasing long-term Arctic heat content and the current fragility of the sea ice. In a recent interview with the BBC, sea ice expert and Cambridge Professor Peter Wadhams noted that Arctic sea ice was ‘headed for oblivion’ within ten years and that the added heat absorbed by the darker Arctic Ocean was like adding ’20 years of CO2′ emissions. In the give and take of the current global warming debate, it’s easy to lose track of context. Thankfully, we have a geological history to use as a window to our past. And by using that window we can see what the world will look like if CO2 levels stay where they are for long periods of time. In this first exploration, we’ll look at current CO2 levels — around 400 parts per million to give a decent idea of how the world will change if we don’t undertake the challenge of reducing these high levels of greenhouse gasses. When Was the Last Time CO2 Levels Were This High? 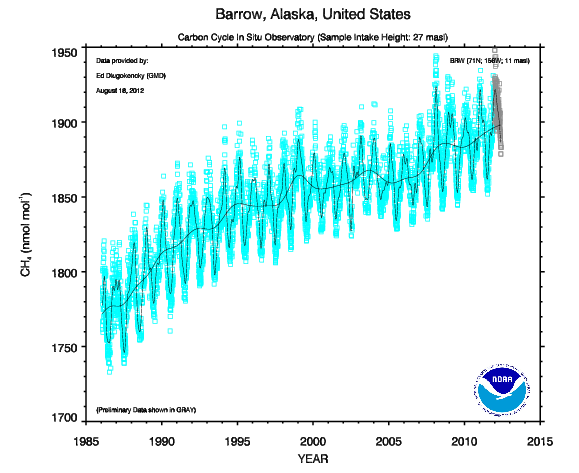 It is important to note that relatively small changes in CO2 can lead to ample warming. During the last ice age, more than 10,000 years ago, CO2 levels were stable in a range between 180 and 210 parts per million. At the ice age’s cessation, CO2 levels rose to 280 parts per million. 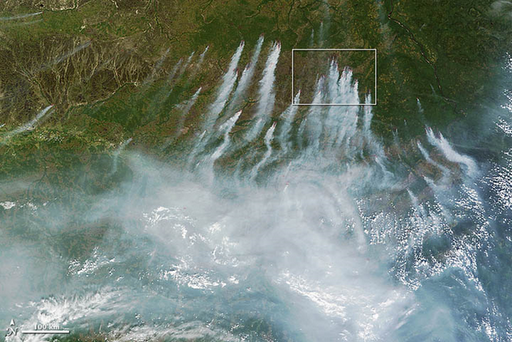 This relatively small rise of about 70 parts per million had dramatic consequences. Temperatures rose by about 5.5 degrees Celcius (10 degrees Fahrenheit). Today, industrial activity and fossil fuel consumption has resulted in nearly 120 parts per million of additional CO2 added to the atmosphere. This addition has occurred over a very short time-scale when compared to past changes in CO2 levels and additions of 2-3 parts per million continue each year. However, assuming CO2 were to stabilize. Assuming that, somehow, the world is able to reign in emissions enough to keep CO2 levels steady at 400 parts per million, what would happen? As mentioned above, geological history gives us a basic notion. Long ago, about 3 million years ago, CO2 levels were steady in a range of 365-410 parts per million. This geological era was called the Pliocene. What Did the Pliocene Look Like? What would seem like a rather small difference in CO2 levels had dramatic effects. The first was that sea levels were 75 feet higher than they are currently today. The second was that average temperatures around the world were 3-4 degrees Celsius warmer (5.4-7.2 degrees Fahrenheit). Greenland and the West Antarctic Ice Sheet were ice free at CO2 levels of 400 parts per million and temperatures 3 degrees Celsius warmer than today. Arctic temperatures were much warmer — 8-16 degrees Celsius warmer than today. This is the kind of world we can expect if CO2 levels are sustained at 400 parts per million. Why Do Climate Models Under-predict Sea Level and Temperature Rise? These historic temperature increases are much greater than those predicted by current climate models. The reason is that these models have not been able to take into account all the feedbacks to CO2 forcing that are intrinsic to the climate system. Models, by their nature, are simplifications and are only as good as the data that goes into them. But looking at geological history, it is quite clear that current climate models underestimate temperature and sea level rise given current levels of CO2. How Fast Will Climate Change at a Constant 400 Parts Per Million CO2? If, somehow, the world were able to stabilize CO2 at 400 parts per million, how fast would the world see 75 foot sea levels and 3-4 degree Celsius temperature increases? In short, this is the one million dollar question. Fossil fuel special interests would like us to believe that these changes would be gradual and slow to happen. In fact, many fossil fuel interests would have us believe that climate change isn’t happening at all, or, if it is, that its impacts will be far milder than the geological record would indicate. Sadly, the fossil fuel companies are misguiding themselves and the rest of us for their own short-term economic gain. Paleoclimate data points to rapid, non-linear, responses to increases in CO2 levels. In some cases, temperatures have rebalanced over the course of decades and normally during periods of centuries or less. In some of the most radical cases, the changes have occurred on time scales measuring as few as ten years. Given the rapid rise of CO2 to its current state and likely feedbacks to result, we could expect to see a majority of that 75 feet in 300-600 years. That means severe consequences could ramp up before the end of this century pushing sea levels by ten to fifteen feet or more. You won’t see the IPCC posting a report that makes this kind of a statement, but it certainly is a potential, even if CO2 levels stabilize at ‘only’ 400 parts per million. Most likely, current predictions of 1-2 meters of sea level rise by the end of this century is still a conservative forecast even for what would happen in a world where CO2 levels remain stable at 400 ppm. Even at constant CO2 levels of 400 ppm, we are looking at sea level rises in the range of 1.5-4.6 meters per century or more. Business As Usual Estimates Place CO2 at Around 1000 Parts Per Million By the End of This Century; What Would That World Look Like? Unfortunately, the world has yet to adopt serious policies that curtail greenhouse gas emission or reduce the level of CO2 in the atmosphere. And, even more concerning, world carbon sinks are beginning to contribute their own greenhouse gasses to the world climate system. Unless very rapid emissions reduction regimes are put into place, the world of the Pliocene, as strange and radically different as it may seem, will look like paradise compared to a world that reaches 600, 800, 0r 1000 parts per million CO2. And it is this increasing likelihood that we will explore in another blog. 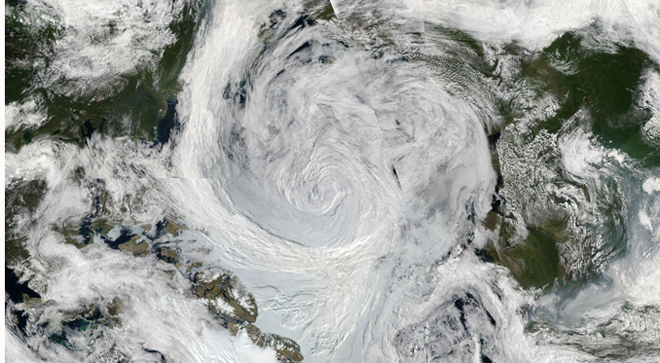 An immense cyclone that has ravaged the Arctic continues its powerful blow today. 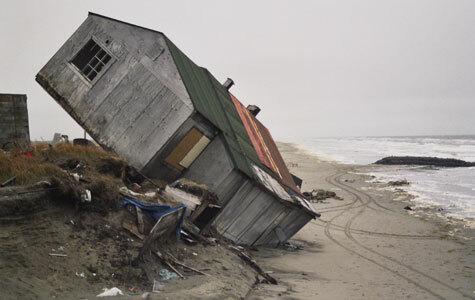 The cyclone, which formed over East Siberian and then ripped through the Arctic has left a wave of chaos in its wake. First, it pushed 10-12 foot seas through a region that rarely sees powerful storms of this type. 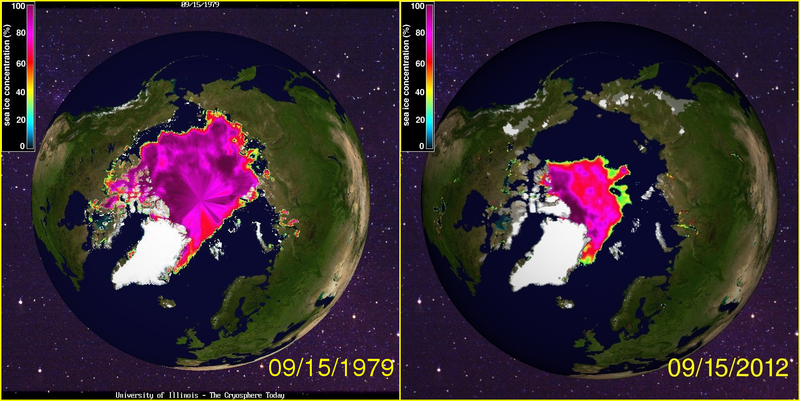 Then, it enhanced sea ice melt in the regions it impacted. Now, it hangs on as a 970 millibar storm system — a pressure level usually seen in tropical cyclones. It is difficult to emphasize how rare this event is. Though summer cyclones do occur, most tend to be weak and have little effect. Usually, the strongest events occur during winter time. 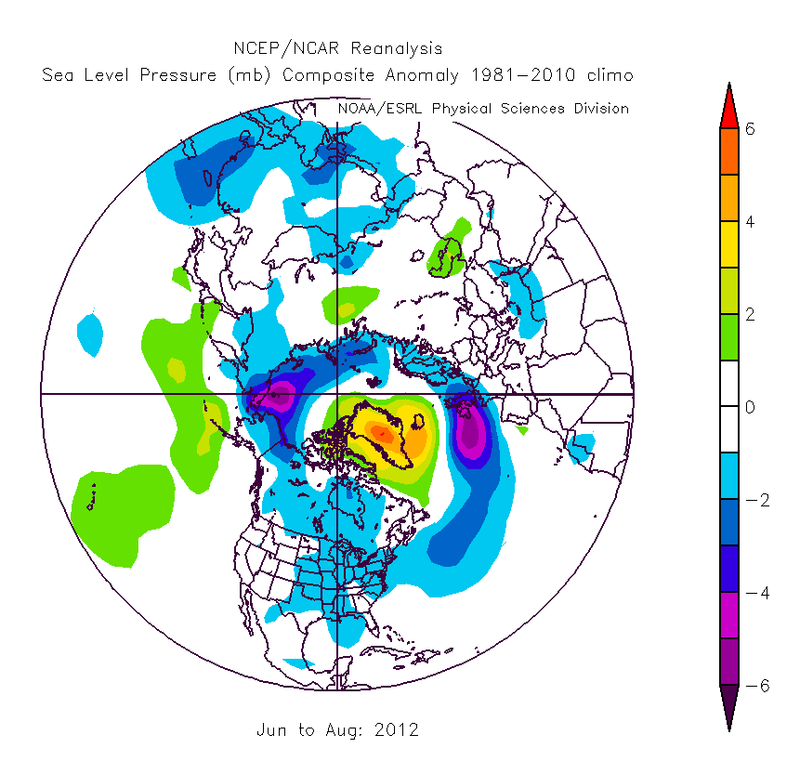 The last powerful summer Arctic cyclone was observed in 2006, but this 2012 event is much more powerful. If these strong summer storm events become more common-place, they are likely to represent another threat to Arctic sea ice. As the storm continued, so has rapid melt. Since August 3rd, more than 360,000 square kilometers of sea ice has been lost — an average rate of more than 70,000 square kilometers each day. Currently, Cryosphere Today is showing a total sea ice area of 3,425,000 square kilometers, a mere 450,000 square kilometers above the record low set in 2007, with more than one month of melt left in this season. For this date, Cryosphere Today is showing sea ice area levels more than 430,000 square kilometers below the previous record low set just last year. Furthermore, something entirely unprecedented is happening to the ice sheet. Driven by storm winds, it appears that a large section of sea ice has detached from the main flow and is now stranded in the East Siberian Sea. This is an event that is without precedent in the satellite record. For years, Arctic researchers have speculated that weakened Arctic sea ice would be vulnerable to detachment from major storm or wind events. Now that speculation is reality. A large area of ice is now detached from the main flow and, due to that detachment, remains vulnerable to enhanced melting around its edges and at its center. In particular, this detachment shows that Arctic sea ice has become even more vulnerable to rapid melt due to another powerful feedback mechanism acting on it. It is difficult to emphasize how important an event this is. In short, it is another powerful and glaring sign that Arctic Sea ice may be in terminal decline. As we cover the current record Arctic melt season and its potential to break the record low set in 2007, it is important to put this event and the events of the past five years into context. In short: no one expected the melt to happen so rapidly. The scientists, who relied on model systems for guidance, found that the models they were using were entirely too conservative and that they consistently under-predicted the great volumes of sea ice melt that kept coming up again and again in observation. Models, in general, are only as good as the information you feed into them. In this case, the rule of garbage-in, garbage-out reigns. If a model is fed false assumptions or incomplete information, it is more likely to put out an erroneous conclusion. And, in general, researchers have been having a beast of a time getting the sea ice melt prediction models right. The blue line represents the average combination of model runs used in the IPCC’s 4th assessment report in 2007 (CMIP3). The information fed into the models was based on the assumed forcing effects caused by business as usual greenhouse gas emissions (business as usual assumes all the fossil fuels will be burned). The blue and purple shaded areas reflect the standard deviation for these model runs. As you can see, the black line representing current Arctic sea ice melt is well outside even the lowest standard deviation range for these first model runs. Recently, a second set of model runs was made in an attempt to more accurately predict Arctic sea ice melt. The average for these model runs is shown by the red line. And the standard deviation for these runs is shown by the pink and purple shaded areas. As you can see, the second set of runs (CMIP5), though more accurate, just barely manages to catch current Arctic Melt within its lower standard deviation. Getting into the data a little, it seems likely that the models are missing a number of feedbacks that are currently impacting the Arctic. Another issue is that models tend to be very bad at managing tipping point events. In short, models tend to make smooth curves, but a tipping point is a jagged turn. Needless to say, climate researchers should be applauded for their efforts as current policy regarding climate change is in dire need of a clear predictive capacity and current efforts to refine these models are likely to increase understanding of how the Arctic is most likely to respond to human-caused global warming.